When China's Han Dynasty (206 B.C.-A.D. 220) opened the ancient Silk Road around 130 B.C. to facilitate trade with the West, women were one of the beneficiaries. Thousands of nameless women who ran or served at the inns along the route or sold things to passing travelers saw their small businesses grow. It also gave them a window to the vast world outside, providing glimpses into other cultures and lives. 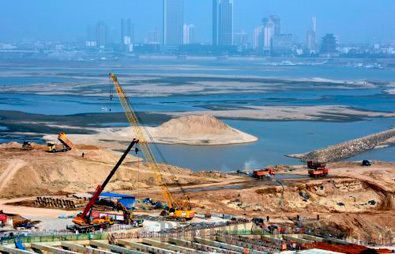 With China's 13th Five-Year Plan (2016-20) to focus on a new Silk Road Economic Belt and a 21st-Century Maritime Silk Road that will revive, extend and modernize the old land and sea routes, women entrepreneurs from South Asia are hailing the initiatives, like their predecessors, in anticipation of the benefits they will bring to them. The two strategies are also known collectively as the Belt and Road Initiative. Sri Lanka, the tiny island nation surrounded by the Indian Ocean, had a historical connection with the two trade routes. "When the overland Silk Road across Central Asia was blocked, [China's] famous Admiral Zheng He visited Galle [a major city in southwest Sri Lanka] in the 15th century," said Rifa Musthapha, chair of the Lankan Women's Chamber of Industry and Commerce (WCIC). "He visited six times between 1405 and 1433, his intention being to open a maritime Silk Road." Though women comprise 52 percent of Sri Lanka's 21-million population, only about 10 percent of the small and medium enterprises are headed by them. The WCIC, targeting to rise at least one rung higher in the ladder of success, thinks the Belt and Road Initiative will provide the stimulus they need. "It will connect a large number of countries in Asia, Europe and Africa," Musthapha said. "Our members include several large-scale companies already engaged in import and export. Our integration into the Silk Road Economic Belt will increase their prospects of widening their business relations. Even micro entrepreneurs' ventures might attract international business houses. Our entry to the business worlds of so many countries in Africa, Europe and Asia, especially China, will boost productivity as well as marketability." 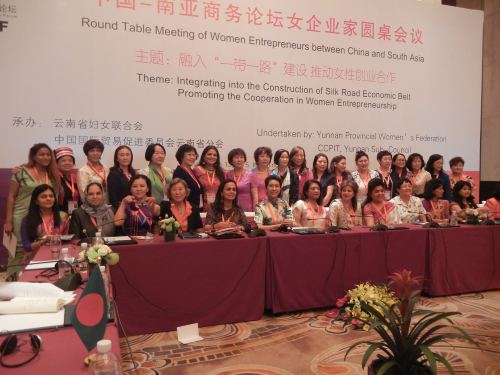 Musthapha and other women business leaders from South Asia and China came together last month in Kunming, Yunnan Province's capital and South and Southeast Asia's gateway to China, for a roundtable of women entrepreneurs from China and South Asia. The initiative was taken to discuss cooperation and integration into the Silk Road Economic Belt. Why is the integration important? Because, down the ages, entrepreneurship has been a universal means for women, especially those with little education and no family wealth, to be economically independent. Governments should promote them by providing training and special schemes as these women contribute not only to the economic well-being of their families but their communities as well as the UN Millennium Development Goals, said Abhilasha Sethia, Vice President of the Indian Chamber of Commerce's Ladies Study Group. While the Indian Government is making regulations to encourage greater women's participation in the economy, such as making it mandatory from April 1 for all listed companies to have at least one woman director on their board, women entrepreneurs need regional and international forums too to share success stories, best practices and methods to manage business problems, Sethia said. In the 21st-century trade routes, she predicts greater participation by women entrepreneurs in the handicrafts, information technology and service sectors, especially in language-related industries. She sees it leading to better education for women and eventually, building a communications bridge to bring the world closer. Besides trade, the ancient Silk Road fostered cultural connectivity, transmitting the customs of one country to another, said Shaista Pervaiz Malik, chair of the SAARC Chamber Women Entrepreneurs' Council, SAARC being a regional bloc of eight South Asian countries, the South Asian Association for Regional Cooperation. "Renewal of the route will serve as a means of increasing cultural trade," Malik said. Long Jiangwen, Vice Chair of China Association of Women Entrepreneurs, elaborated how this will happen. The cultures of the West and East had interacted and integrated through the Silk Road, she said. With the new initiative, "culture tourism, trade, finance, transport and infrastructure will be the first to develop." A sizeable number of women work in these sectors; more projects will link entrepreneurs with companies. However, women entrepreneurs will also have to overcome barriers. "Globalization brings serious and common challenges," warned Lu Yamin, Vice Director of All-China Women's Federation's international department. "Like difficulty in getting funding, policies that are not friendly enough, lobbying for improved legislation for equality in job, training opportunities and pay." Developing economies have more challenges. In Nepal, one of the poorest countries in the world, 38 percent of the nearly 30-million population live on or below the poverty line, with an income of less than $1.25 a day. Poverty victimizes women and girls, especially through trafficking, and forces en masse migration abroad every month for livelihood, said Anjan Shakya, executive member of Nepal Chamber of Commerce. There are natural calamities like the earthquake in April that killed over 8,500 people, and overall, there is the patriarchal mindset that treats women as inferior. Shakya said Nepal would be included in the revived Silk Road route, which would increase the landlocked country's market access. The clock is ticking, and there is a pressing need to step up women's empowerment. As Lu said, "the 21st century is known as the She Century with women assuming more important roles." It is also the year that will see the 20th anniversary of the Fourth World Conference on Women. Convened from September 4-15, the historic meet saw the formulation of the Beijing Declaration and Platform for Action, which laid down the framework of a universal policy for gender equality. Beijing hosted the landmark event and in September, the clock will come full circle when the Chinese Government will co-host and organize, in collaboration with the UN Women agency, a Global Leaders' Meeting on Achieving Gender Equality and Women's Empowerment to assess the progress made. China has kept its pledge made two decades ago. Women play a prominent role in both Chinese society and the economy. Lu pointed out that women comprise 45 percent of China's workforce and 40 percent of the country's scientists are women. Women have considerable presence in information technology, communications and finance, and the Fortune 500 list of the 500 biggest companies in the world features Chinese women entrepreneurs. 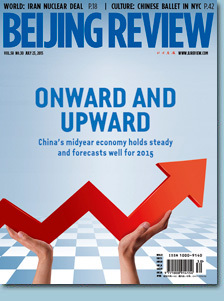 Consequently, neighbors are looking up to Chinese women entrepreneurs for know-how. "We lack technology," said Rokia Afzal Rahman, Vice President, International Chamber of Commerce, Bangladesh. "We can learn from you. We need to cooperate and integrate to become a solid bloc. We need to work as partners and sisters, exchanging best practices." Chinese women entrepreneurs are ready to do that. "We should share business opportunities and work for the common prosperity of Chinese and South Asian women," said He Hongmei, President of the Yunnan Provincial Women's Federation. "Together we will create a new chapter--for the women of China and South Asia."